Gumboots Early Learning Centre is housed in a purpose-built building by Sovereign Homes, designed to exceed Ministry of Education space requirements, and with the benefit of underfloor heating and extra acoustic properties in the floor, wall and ceiling coverings. The Gumboots building faces north with wonderful rural views. The playground will be extensive, offering a wide range of spaces and activities for children, and has been carefully planned to allow separation between age groups but with a visual integration. Great care has gone into planning Gumboots to create a 'home away from home' environment for the children, where they can feel safe and comfortable with plenty to stimulate them every day. With other local facilities at capacity, Gumboots is an alternative for children whose families work and who would otherwise have to enrol outside the area to find a place in quality daily care. With this in mind, Gumboots is open from 7.00am until 6.00pm to cater for the commuting families. Peak Road is just a 1km detour for travellers via Helensville who use the Old North Road route into the city. Gumboots also offers morning and afternoon sessions for local children who benefit from the interaction with other children in an environment created to enrich the lives of those who enjoy it. 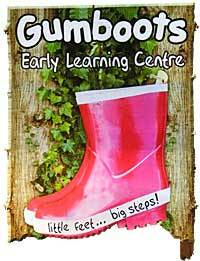 Staff at Gumboots are selected for their passion, motivation, creativity, and genuine love of children. The quality and care that has gone into developing the building is matched by the learning and care programme being implemented. Gumboots aims to exceed any Ministry of Education requirements, and provides a range of activities that is far more than just ABC’s and 123’s but also incorporates dance and movement, regular concerts, music and singing, physical exercise and ball skills, gardening and nature studies to name but a few. Children can have fun exploring on their own and playing with others. They will form friendships and bonds, some which will last a lifetime. For further information please visit our website www.gumboots.ac.nz. Enrolment forms are available on our website, or you can request them by phone on 411 9038 (please leave a message). We are happy to meet any family who would like to enroll.